Camping Stove or a Backpacking Stove? Grill Stove or Grill Plate? Gone are the days when you had to rely on dehydrated packaged food to sustain yourself on long camping trips. Today’s technologies allow us to have fresh and restaurant-quality food right within the dense forest with a good camping stove. Now, we’ll find out about the best camping stoves to take with you on your camping trip. A camping stove differs very much from a backpacking stove. While a backpacking stove is often cheap, primitive and offers a poor flame that you have to put up with. A camping stove is your familiar’s kitchen stove brought up to a new level into the outside. It gives you a more consistent, stronger and more control over your flame. A camping stove is very durable and can be made to withstand quite a lot of punishments. It can also hold a larger amount of cookware at the same time on top of it as well. But the other side of the coin is that they are often quite bulky and heavy. A camping stove can only be accessed if your car’s parking space is close to your camping site. A backpacking stove is a different story: It is cheaper, more efficient but it is also smaller and can be fitted into a backpack without problems. Depending on the model, a backpacking stove can only be used to boil water to sterilize it. However, some other models can cook a small meal by using ultralight cookware – though, admittedly, not very well. Because they’re made to be as light as possible, they can easily be damaged. 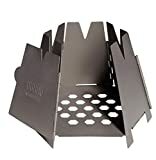 Most backpacking stoves incorporate aluminum, but the material is very pliable and can be bent easily. Some higher-end stoves use titanium to fix this problem somewhat, but it’s far from a perfect patch. It ultimately depends on the details of your trip to determine which kind of stoves you should invest in. Size is always the most important criteria in all sporting and camping equipment. Camping stoves are known to be large and bulky, so you should cut down as much as you possibly could. There are two general sizes to take your pick on A tabletop, compact burner, and a large freestanding burner. Choosing the right stove size depends on some meals you intend to serve. If your group is around 3-4 people, a tabletop burner would be best for you. And when your group has 5 or more heads, you should consider getting a larger burner to do the task. Canister stoves use separate fuel canisters to feed the flame. Canisters depend on the stove, and they can store either propane or natural gases within. Canisters are light, compact, easy to use, require no maintenance and also burn very cleanly without residues. The downside is that they might not work as well in the colder environment and are quite expensive. While liquid fuel is much cheaper than canisters, it is heavier and messier to use. Requiring quite a lot of maintenance, harder to use and more dangerous as it could spill and spark a fire. But on the other hand, it can work very well in sub-zero temperature. The fuel itself is much cheaper than gas, and their bottles can be refilled. Liquid fuel is available internationally, too, so you should take this into consideration when going abroad. Alcohol stoves are pretty common and popular to hikers due to their simplicity and inexpensiveness. It can be found at pretty much everywhere, and it’s also dirt cheap to buy. An alcohol stove is cheaper to buy – and if you have a crafty hand, you can even make one yourself. Alcohol stoves are often extremely light, too. However, alcohol is horrid at cooking, and their flame will take much longer to cook than other types of fuel. And if you’re in a windy area without a windshield in place around the stove, it’ll be hell trying to stop the flame from flickering constantly. There’s also no temperature control, so when you spark it up, that’s all you’re going to get. They’re also dangerous to use if you’re not careful, as the flame is dim and alcohol can be spilled easily. Solid fuels are the simplest type of fuel you can find a stove using. The fuel comes in tablets and when you need it, just plucks one; light and you have a fire ready. Thus, they’re very compact and light. The stove is also very simple, and you don’t need to worry about spillage. The downsides, however, are numerous. Fuel tabs are expensive and hard to find, the fire is quite inefficient with slow cooking time. The fire also leaves an uncomfortable and unpleasant odor that can be disconcerting to a lot of people. Wood stoves are classics and the first thing that comes to mind whenever you think of a camping stove. Firewood is almost everywhere at a typical camping site. Thus, it is often free and can be replenished immediately. And they also add to the sentimental value. Firewood is almost everywhere at a typical camping site. Thus, it is often free and can be replenished immediately. And they also add to the sentimental value. But effectively using a wood stove requires some knowledge and practice beforehand. They also require you to work for it, as you have to gather woods whenever you can constantly. Logs are also heavier and will be harder to find when you’re in tree-scarce areas or after rain. Wood also releases a lot of soot and can blacken your cookware. Logs are also heavier and will be harder to find when you’re in tree-scarce areas or after rain. Wood also releases a lot of soot and can blacken your cookware. The British Thermal Unit (BTU) is a term referring to the thermal output of a stove. The higher the BTU is, the more heat the stove produces. But certainly, the stove itself will be more expensive as a result and will use a lot more fuel. Take the nature of your trip such as a number of people and budget into consideration and save your wallet. More is not necessarily better. The BTU rating of a stove can give you a pretty good clue on how long it’ll take for a stove to boil water. However, you definitely won’t know for sure if you put it in the typical camping scenario: High wind, low temperature and water volume and there’ll be a lot of question marks. A good camping stove should have, obviously, a low time to boil. This means you just need to watch in frustration a fuming pot for an hour and then relax for a few minutes. When you’re cooking, you don’t need a raging inferno under your cooking pot all the time. A lot of stoves focus on decreasing their time to boil that they gutter the simmering capability. Cooking is a delicate business, and sometimes you only need a small fire to do it without the burner shutting off. A good stove should be able to acknowledge this. Then wind: The Wind is the worst nemesis of a stove. Try to find models with large windshields that can protect the fire well if you’re camping in a windy area. This will provide a much more efficient flame and thus, a quicker cooking process. Propane is a convenience, while liquid fuel is efficiency. Not only Propane is cheaper and more accessible than liquid fuel, but it’s also easier to use. It will spark a fire as soon as it’s introduced into the burner and it will burn cleanly without residues. It also doesn’t require a pumping hose like liquid fuel to lead it up into the stove. Liquid fuel, on the other hand, can burn even in extremely cold temperatures. It will also sustain a fire brightly until the last drop is gone. Propane will begin to lose its integrity as soon as the canister gins to empty, so this is a great step-up. It all depends on your environment and your preference. A grill stove is much more redundant than just getting a grill plate. While a grill stove is dedicated entirely to the grilling process, a grill plate is an add-on to a burner. When you need to grill something, you can just drape a grill plate over the burner and do it. That can’t be said to a grill stove when you need to cook some soup, however. Nobody likes cleaning things while camping but you have much more things to do than scrubbing a pot. That is why a stove that can ease the cleaning process is very much appreciated. The ignition of the stove must be simple enough to operate while at the same time safe to use. A stove can be considered a failure in design if you need to check the manual to know how to operate. And of course, if it explodes in your face – it’s a failure, too. Other than that, the ignition needs to burn cleanly without producing much soot and can sustain the fire adequately. Weight is a large factor when choosing a camping stove. As I have said, a camping stove is known for being large and heavy; you don’t want any extra pound. Best camping stoves are models that can balance between power and weight. Cost is a deciding factor – if you can’t afford it, all of the things above will be for naught. Take in mind also for the purpose you need a camping stove for More expensive stoves are often larger and more powerful that can feed a lot of people. If you don’t have a lot of mouths to feed, you shouldn’t opt for the biggest in the store. The stove has to be able to produce a constant flame without needing much maintenance. This is a large point. Maintenance is often expensive or takes a lot of time, and always: You have much more important things to do than looking for your stove. The Vargo Hexagon is an extremely simple, ergonomic but at the same time, durable stove. Weighing half a pound and comprised of removable folding panels constructed of Titanium, it is a lightweight and compact stove. The entire structure of the stove is constructed of Titanium, making it very durable to both fire and roughness. The conical panels act both as windshields and directing the heat upward to the pot at the same time. The panels are also hinged and can be snapped in place quickly without having to fix them around. The price is a bit sour, and you might need to do some modifications to improve ventilations. But overall, it’s the best camping stove of this category. Durable structure made of Titanium. Need some modifications for better efficiency. Flexible, lightweight and efficient – it can be considered one of the best alcohol burners on the market right now. The stove is a small, circular metal box that weighs a quarter of a pound. The entire thing is only 2.85×1.75 inches big, so you won’t have any problem giving it a place in your backpack. It can output about 1000W with a boil time of 8 minutes per liter at the best condition. The stove has three main components: Burner, simmer ring and a cap. When the fire’s burning, you can control it using the simmer ring and can seal it shut with the cap – saving fuel. 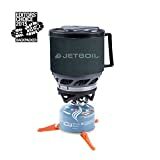 The Jetboil MiniMo is a robust but efficient stove that is some of the greatest choices in the canister department. It weighs approximately a pound without a canister and only 5 inches tall. Even though it’s not so small that you can carry in your backpack, it’s not hard to hand carry it. The valve and regulator are redesigned from earlier models of Jetboil for better efficiency and a greater simmer control. The design contributes to a greater degree of comfortability with a large metal handle, insulated lid, and measurement cup. The igniter is easy to operate with just a push of a button. It’s a bit cheaper. However, it’d be great, so you can’t complain at the value. Lightweight and small for a canister design. Has to carry a separate canister. A stove that’s made for quick deployment and portability, the Coleman stove is a great on-the-go design. It has a weight of 5 pounds and 20x12x4 inches in size and can be carried anywhere in its case. Its operation is extremely simple: You only need to lock in the butane cylinder, adjust the burner control and a flame will flick in no time. Windshields around the burner will also help abate wind, and the support can handle a 10-inches pan easily. Having a 7,650 BTU output, the stove will allow you to ready a meal in no time at all. Afterward, the porcelain surface can be cleaned easily with a baby wipe. 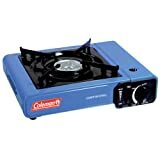 If you have a tabletop, the Coleman stove can be fitted in without much of a problem. A versatile stove fits for usage almost everywhere in an adventure or an emergency. It deserves its spot on the list of being some of the best camping stoves. 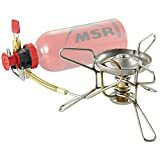 The MSR WhisperLite stove is classicality, reliability, durability, and efficiency all rolled into one white gas burner. Its weight is about 0.7 pounds on its own with a 4x6x9 dimension. It is a bad fit into your backpack, but it’s easy to carry by hand. The stove is made of a combination of stainless steel and brass. Highly resistant to fire, it’s made to last for a long time. It has a boil time of 3.9 minutes for a liter of water with white gas and all of its varieties. The WhisperLite is power blended with durability – making it a great option for hikers or adventurers. The stove is also designed to be easily cleaned, making it low maintained and a bit more pleasing to use. Easy to overfill the priming cup with fuel. A stove is a must-have within the inventory of a backpacker or a camper. After all, going without food – or with it but in horrible style isn’t much of a boost to your morale. We hope this guide benefit your search for the best camping stoves for you!